Orbital No 1 is a first person perspective of three circular journeys completed and recorded as real time videos. These are screened as three concentric rings of continual movement – from the Circle Line, the North and South Circular and the M25. They give a glimpse of the dizzying energy states that define the contemporary urban structure spinning outwards in roughly circular zones centrifugally pinned to the epicentre of the city. 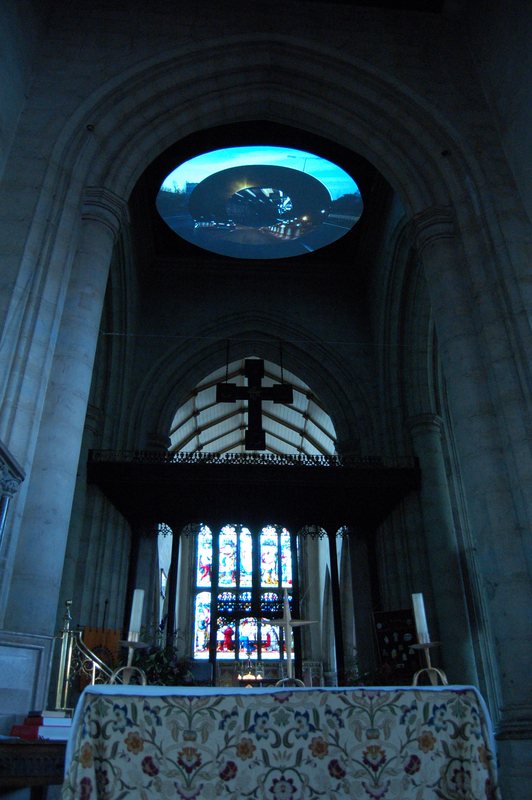 Suspended horizontally within the tower of St Mary’s Church at the hub of Ashford, Orbital took the form of a moving Mandela, an image analogous to the concentric circles of Dante’s heaven and hell.